Mercedes-Benz Stadium was packed with die-hard Patriots and Rams fans last Sunday and more than 100 million others joined in rooting for their teams from home. For the last 53 years, no other sporting event has been able to match the excitement and pageantry of the Super Bowl. With a recent slump in viewership, the NFL has intentionally increased their connection with fans through mobile devices and social media strategy. Here are some lessons that every event planner can take from the Super Bowl’s successful use of technology to engage fans. To ensure that Super Bowl attendees are able to connect on demand, the NFL starts planning for next year’s event as soon as the final whistle blows on the current game. When it comes to large scale event, John Brams, a member of the NFL’s official WiFi analytics provider, believes that a year gives event planners the optimal time to assess bandwidth needs. You may not need a full year to evaluate WiFi bandwidth needs for your event, but it should be on your radar early on. Waiting until the last minute to analyze your WiFi usage history and adjusting your plan accordingly can make your event susceptible to poor coverage and, worst of all, leave your attendees with a bitter view of your event. Our event production experts work with you to conduct a comprehensive review of your previous usage and make recommendations about your bandwidth needs at your upcoming event. The Super Bowl may take place inside a stadium, but it’s far from being in a vacuum. From the airport to the stadium and every point in between, event organizers want fans to be able to connect and share their experiences seamlessly. Event planners and production crews work with representatives from the host stadium, city officials, local convention and visitor bureau (CVB) representatives, and the NFL committee to ensure that fans have a smooth, fast, and secure WiFi experience. As an event planner, you’ll need to work closely with your team of suppliers, convention center reps, hotels, CVB officials, and numerous other vendors to provide the right technology and WiFi offerings to your attendees. With everything else you have on your plate, tracking all these moving pieces can be a hassle. The right event production partner can help coordinate technology needs among all of the team members. 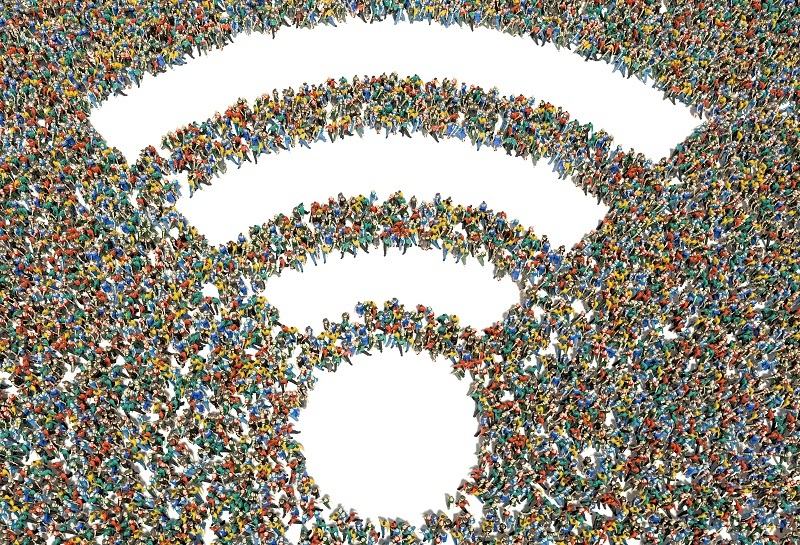 Last year, Super Bowl LII set a new record for the most WiFi used at a single-day event with fans using a whopping 16.31 terabytes (TB) of data on the NFL’s wireless network, far exceeded the projected 12 TB of usage based on prior years’ usage. This year, those numbers are again expected to sharply increase, and the NFL and Mercedes-Benz Stadium are prepared to meet that need. With nearly 2,000 wireless access points and a neutral host distributed antenna system that all four major carries support, fans at Super Bowl LIII had no problems getting connected and sharing their Super Bowl experience with the world. While your event may not see quite as much WiFi usage as the Super Bowl, you should always assume that your needs will be greater than previous years and plan accordingly. Event attendees want to be able to connect to the world and share their experiences in real time. Is your WiFi network up to that task? WiFi hotspot rentals cover an unlimited number of users and can accommodate any amount of data usage. In addition to attending to event bandwidth needs, Super Bowl organizers pay attention to the way that that data is used. The most used apps are Facebook, Snapchat, Twitter, Instagram, and music live streaming apps. Understanding how fans use social media at events lets the NFL develop social media strategies to keep viewers engaged. From curating a list of social media hashtags to creating custom event playlists, the NFL helps keep fans engrossed in the overall Super Bowl experience. Even if your event isn’t on the same scale as the Super Bowl, keeping your event attendees engaged with your event on social media is vital to the success of your event. If your visitors frequently use Facebook, Twitter, or Snapchat, you can set up photo booth rentals that allow users to instantly share their event experiences with their friends and followers. You can even use those images and those shared on social media with your event hashtags to create a curated social media stream. The NFL launched the first version of the Super Bowl app in 2011 and it’s been a staple of the event ever since. From helping guide fans to closest bathrooms (or helping them find the shortest lines) to ordering food from their seats and allowing fans to submit photos for social media and offering player details, the app has been made the Super Bowl experience easier for attendees while helping fans stay connected. Custom event apps can help create a smoother and more pleasurable experience for your event attendees – but only if they actually use it. Send out surveys to participants about what they want from the app and what features would be most useful to them. During the first year, be sure to provide tech support at the event to help users understand how to use the app and get the most benefit from it. Remember that attendees will probably use your app in addition to those they already use, so plan your bandwidth accordingly. Whether you’re planning a sporting event, concert, or corporate event, helping your attendees stay connected is critical to the success of your event. Understanding the WiFi and bandwidth needs for your next event may seem daunting, but our event production services experts are here to help. By streamlining the production and event technology rental aspects of your celebration, our event production services let you focus on making your event a success while we handle the nuts and bolts of production. Our service-oriented approach starts with understanding your event needs and creating a detailed plan that guarantees success. Our trained technology, lighting, and sound technicians help ensure that your event goes off without a hitch.